Last Friday I finally got to see what I was waiting for since the first time I heard it was in production. I know the craze has been overwhelming. I was even discussing it it my cousin, who is also a big fan. But as he’s 5 years older he was wondering why the hype was that much. We trying to remember if it was was the same when the last 3 movies were released. And here comes the power of social media. However, hype or not (as you can see from the pic in my case it’s HYPE), the movie was absolutely all I was hoping for. The story is captivating though not new and as a stand alone movie, it is far from disappointing. The new characters are interesting, different and at the same time familiar. I love that we get to meet one of the Stormtroopers and that he’s fun and neurotic. Rey, a scavenger from a desert planet who doesn’t know her parents (ahem, Luke anyone) is a great strong female center character. Kylo Ren as the bad guy is a nice mixture between a troubled young man and a powerful Sith with anger issues. I also loved that we got to see him without his mask. Poe is the dashing Xwing Pilot from the resistance and the owner of the cute BB8 robot. There are more new secondary characters and Han, Leia, Luke, Chewie, C3P0 and R2D2 all return for the enjoyment of old and new fans. I won’t share any spoilers, but I’d say the story is similar to A New Hope. It’s not a bad thing as for older fans its an awesome nostalgia experience and for newer fans its a great introduction to the Star Wars universe. If you’re bored enough to read my blog regularly, you probably know my interests. 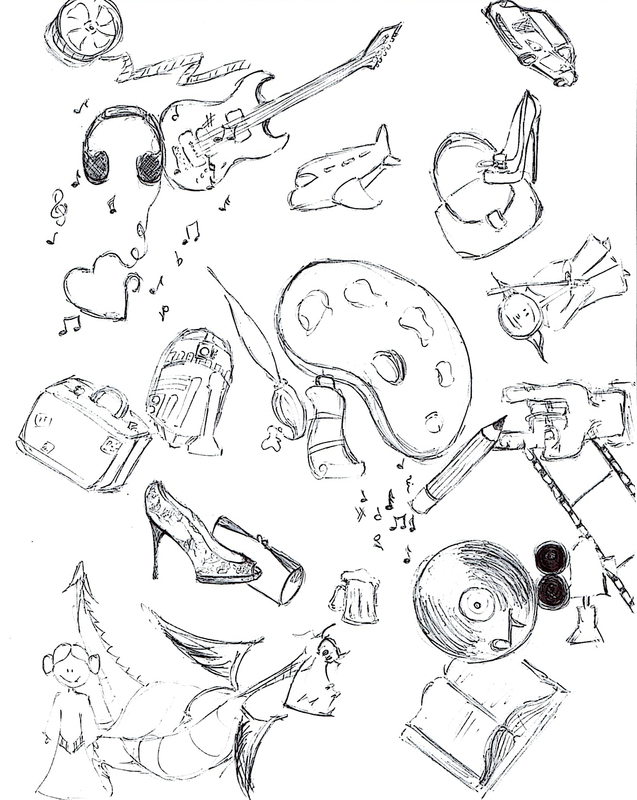 Today I’ve put together a little scetch of most of my favorite things. Music, movies, books, art and drawing,cars, fashion, travel, Star Wars, fantasy and dragons, and beer:D I hope you’ll like it and I’d love to hear what are the things that put a smile on your face when you get up in the morning or get home after work.